CALGARY, Alberta (AP) — Tyler Seguin and Jamie Benn took full advantage of a poor defensive effort by the Calgary Flames. It was redemption for Benn, the Dallas captain, who took two minor penalties in the third period. The second one led to Johnny Gaudreau’s goal at 9:41 that made it 2-all. The Stars tied it less than three minutes later. Matthew Tkachuk’s clearing attempt went onto the stick of Bayreuther and the rookie defenseman fired his second of the season past Rittich. Gaudreau and Sean Monahan each finished minus-3 for the Flames. 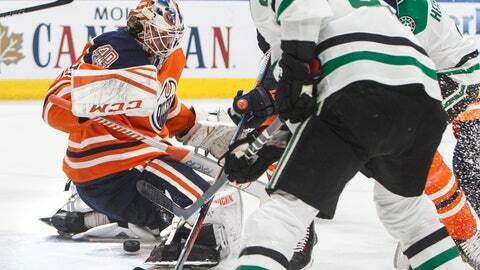 They were on the ice when Spezza slipped into the slot undetected and one-timed Radek Faksa’s pass behind Rittich just 41 seconds into the game. It was their missed coverage in overtime, too. NOTES: Khudobin started again in the absence of Ben Bishop (lower body), who is expected back Saturday after missing the last five games. … Rittich finished with 24 saves. He dropped to 8-2-1. … The Stars improved to 6-1-1 in their last eight games at the Saddledome. … Calgary LW Michael Frolik (lower body) is back skating. He has missed four games.